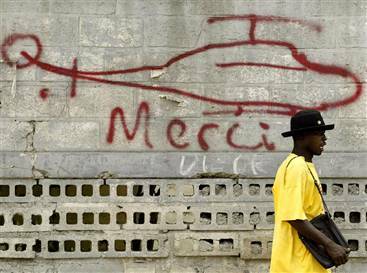 It’s 24 hours since unmitigated disaster struck Haiti. Their biggest earthquake for over 2 centuries, and the latest in a line of disasters that have left them devastated. For my part I’ll do my bit, however tiny, by giving and also by praying for the God of love and hope to hold the people of Haiti close. I’ll also be praying for understanding of how it is that the God whom we trust to love us could let this happen, and how we should respond, both now and in the long term (how can it be right for any state to have been in such a mess even before this happened? )… I can’t help but feel we all bear an element of responsibility as fellow humans. Yet again, I don’t get how God works. But then there’s nothing very new about that. This entry was posted in Uncategorized and tagged Don Miller, god, Haiti, Jesus, Pat Robertson, prayer. Bookmark the permalink. It’s simple. According to fundamentalists, bad things happen to bad people, good things happen to good people.